If you were living during the 11th century, you would likely have heard of the Talbot hound. The Talbot was a descendent of the St. Hubert Hound and laid the bloodlines for the Black and Tan Coonhound. They were used to hunt raccoons and possums, but didn’t shy away from bigger game like mountain lions, deer, and even bears. The Black and Tan was also the first coonhound to be considered a breed separate from the American Foxhound. The American Kennel Club recognized the Black and Tan Coonhound in 1945. What’s the Black and Tan Coonhound like? The Black and Tan Coonhound is friendly, active, and gentle. He loves his family and is great with children. He also needs plenty of exercise (e.g., a nice long jog or a good hike). He loves hunting, has an excellent scenting ability and may dart after small critters; it’s important to have a secure fenced yard if he’s let off leash. 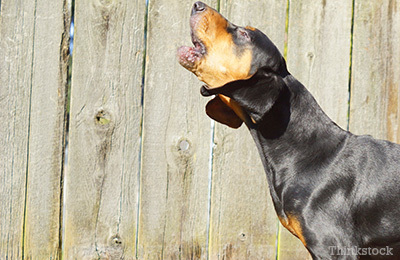 Earing training is necessary if you don’t want your coonhound to wake the neighbors — he’s a howler. He can also be pretty stubborn so make sure you show him you’re the boss with firm and consistent training. Always use positive reinforcements; treats are an excellent motivator. Grooming your Black and Tan is a breeze. Because of his short and dense coat you’ll only need to brush him a few times a week to remove any dead hair before it ends up all over your house, he’s a shedder. The Black and Tan Coonhound is great with kids. The Black and Tan Coonhound would make an excellent hunting companion. The Black and Tan Coonhound is very easy to groom, but sheds frequently. The Black and Tan Coonhound can be loud, so apartment living isn’t ideal.